Yoga has dramatically gained popularity in the United States over the past few decades. Originally a spiritual practice that was employed by Hindus, yoga now is recognized for its myriad health benefits. 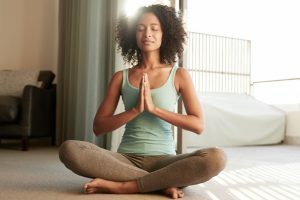 There are many types of yoga, from gentle yoga poses combined with meditation to more physically active poses intended to strengthen muscles. For people with back pain, yoga can be a fantastic way to strengthen muscles and improve spine health. Many problems with the back and spine originate from poor posture. In turn, having back or spine issues can make your posture even worse, exacerbating the problem. Performing yoga is a great way to improve your posture. For example, many common yoga poses (e.g., Downward-Facing Dog, Bridge Pose), activate the abdominal and back muscles. This helps you maintain an erect spine when sitting or standing. Many back problems arise from weakness in the back muscles relative to other parts of the body, which can put extra tension on the spine. Holding poses in yoga helps to strengthen your back muscles, which may reduce your back pain. When holding yoga poses, focus intently on keeping your back straight and in good alignment. This ensures that you work your back muscles optimally. One of the major sources of back pain is excessive tension in muscles of the back and shoulders. During a yoga session, you will hold poses for 15 to 60 seconds. This gives your muscles time to stretch, increasing flexibility. Even within a yoga session, you may notice that your back muscles feel more relaxed and flexible at the end of the session than at the beginning. Our spine specialists know that one of the best ways to prevent injury to your back is to improve your body awareness. Performing yoga encourages you to think about your body and its movements. This gives you a greater sense of what types of movements may cause you pain or injury versus movements that improve flexibility and strength. Increasing this body awareness can be a great way to prevent further back and spine problems. Yoga is a healing technique that can improve posture, promote healthy spine alignment and strengthen core muscles. If you continue to experience back pain after performing yoga exercises for strength, it may be time to visit a physical therapist or orthopedic surgeon for treatment recommendations such as back surgery. Contact Southeast Orthopedic Specialists today to learn how we can help.